Exterior of Fort York branch. Second-floor seating area along north windows. The green screen in the Digital Innovation Hub. A demonstration of the all-in-one DJ unit. “Far from anachronisms,” Building magazine declared earlier this year, “public libraries need to be the civic backbone of the Information Age.” While some misguided souls proclaim that libraries will soon be rendered obsolete by the digital age (and are therefore unworthy of public funding), systems like the Toronto Public Library are transforming their branches into community spaces where citizens connect, create, or relax. It also smells nice, thanks to the Douglas fir used in the ceiling beams and along the central staircase. The wood motifs are a nod by designer KPMB Architects to the wharves that once lined the nearby shoreline. Another historical nod, public art collaboration by Margaret Atwood and Charles Pachter based on The Journals of Susanna Moodie, will be installed later this summer. Most of the library has been designed with the comfort of users in mind. From the circle of chairs in the magazine nook to the letters on the floor of the children’s section, seating options are abundant. Many of the seats are lined up along the windows on the north and west sides, and offer, according to Bailey, “unparalleled” views. Users can collect their thoughts while staring at Fort York, watching streetcars roll down Bathurst Street, pitying the fools stuck in traffic on the Gardiner Expressway, or viewing the construction of neighbouring parks and residences. Communal tables, two of which are semi-enclosed by red-lined walls, offer workspace. The overall space is designed for flexibility, so that areas can be reconfigured based on user needs and technology-spurred service changes. The second floor houses the library’s main creative centre, the Digital Innovation Hub. This space highlights the TPL’s growing embrace of digital technologies, with gizmos ranging from USB-friendly DJ equipment to a 3D printer. Budding filmmakers have access to production tools such as green screens. The branch will offer classes on how to use the equipment, providing greater community access to these technologies. Work created in the hub will be showcased throughout the building via digital display screens. Today’s opening represented, of course, the result of years of work. The library board chose the site at the northeast corner of Bathurst Street and Fort York Boulevard in 2006. The branch’s $9.2-million capital budget was covered through Section 37 funds (which involve developers being granted extra density as long as they provide community infrastructure), along with development charges and public art contributions. Both builder (Context Development) and architect (KPMB) were in place by 2010, and four public consultation sessions followed. Construction began in September 2012. Being part of a new neighbourhood meant certain construction challenges—water hookup and the creation of street access, for example. The latter is still an issue, at least for those approaching via Bathurst Street—although the building does flank Bathurst, you can’t access it directly from there unless you illegally hop a construction fence. 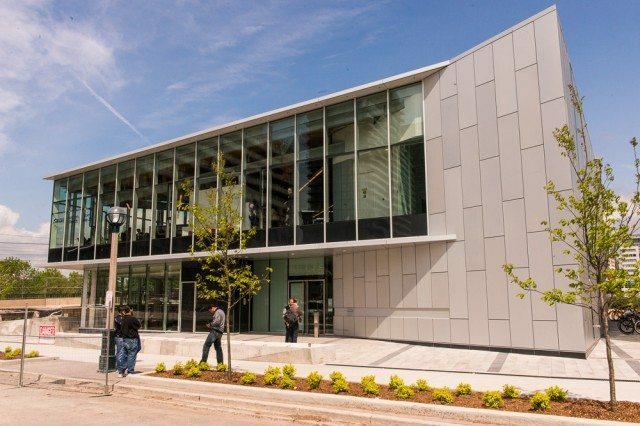 Libraries offer more than printed words; they serve, as KPMB architect Shirley Blumberg told the Star last year, as “the urban living room.” The opening of Fort York, along with the TPL’s other renovation projects, proves that Toronto realizes that libraries have a vital future.